Product categories of SPC Flooring, we are specialized manufacturers from China, SPC Flooring, Rigid Flooring suppliers/factory, wholesale high-quality products of Rigid Core Flooring R & D and manufacturing, we have the perfect after-sales service and technical support. Look forward to your cooperation! SPC stands for Stone Plastic Composite. And DECNO`S SPC Flooring is designed to exceed. The main component is lime stone (calcium carbonate)+ PVC Powder + Stabilizer. Different from regular vinyl floor, there is no plasticiser inside, so it is more environmentally friendly. 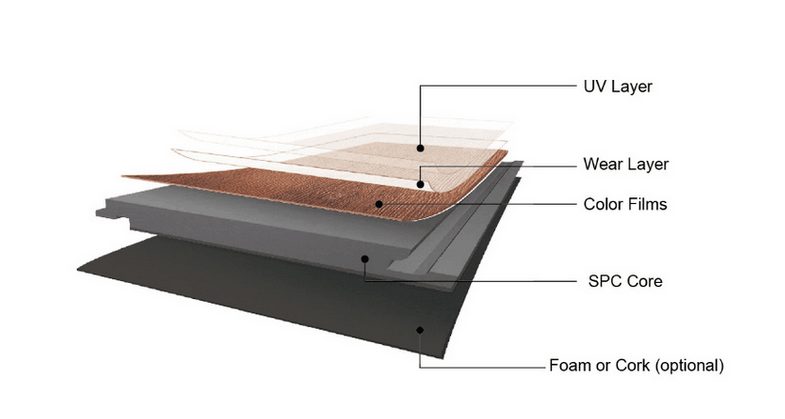 SPC flooring mainly structured with the UV Coating , abrasion resistant paper ,decorative paper film and core board. Meanwhile IXPE& CORK option available for high end usage. SPC flooringprovides a broad range of natural designs, from realistic wood grains to elegant stones and rustic slates - choose the one that suits your lifestyle and your home.